“Let’s play mallet’s mallet” – Timmy Mallet, Wacaday (1980s). Well I thought I’d had some crazy journeys in life but this one topped them all for ridiculous wackiness. I half expected Timmy Mallet to come out and whack me on the head at any moment and shout “Wacaday” at me! This could be lunacy on its head, with a 1990s Television thrown into the mix for good measure and a theme that links back to a 1980s TV show – Mallet’s Mallet. 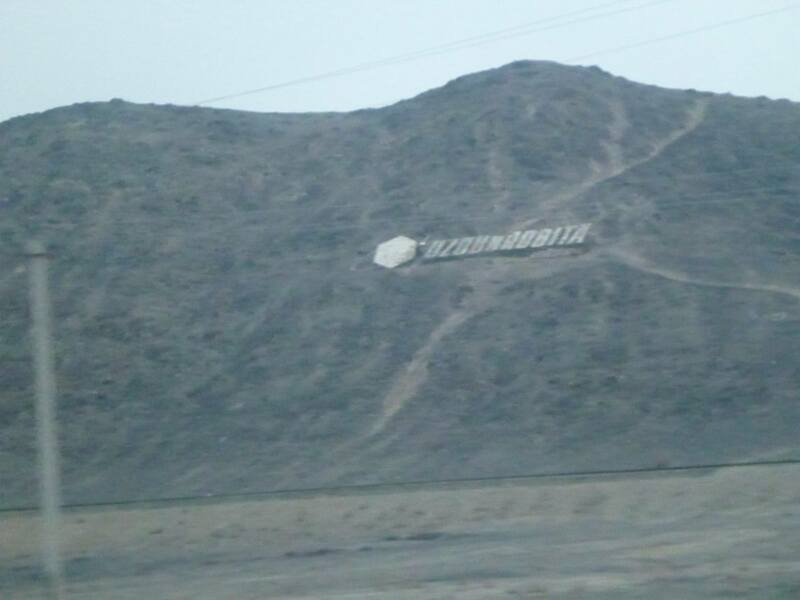 Welcome to the Republic of Karakalpakstan! Seriously mate, where the duck is that? 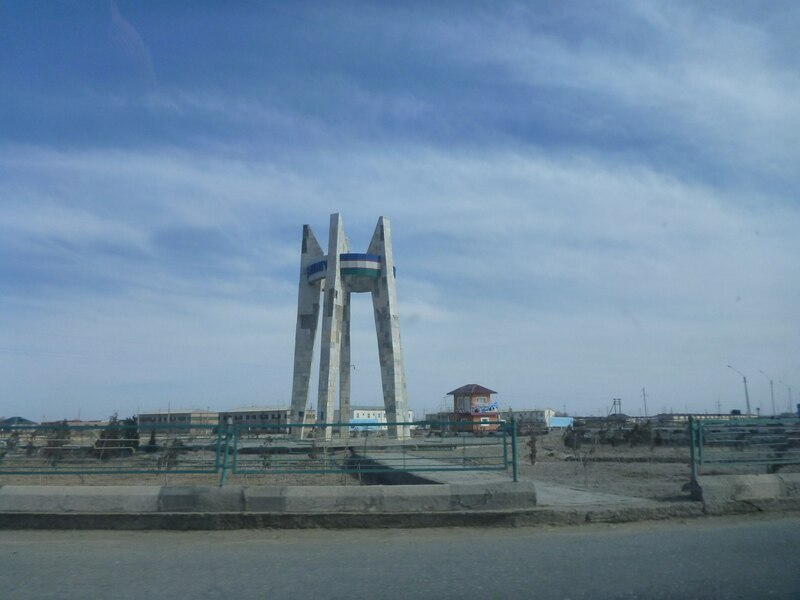 It’s real, it’s very real and I spent 24 hours in its capital city Nukus which was as obscure as they come, this place turns the phrase “ridiculous” on its head. An odd place to linger maybe but let’s hear about the journey that took me there. 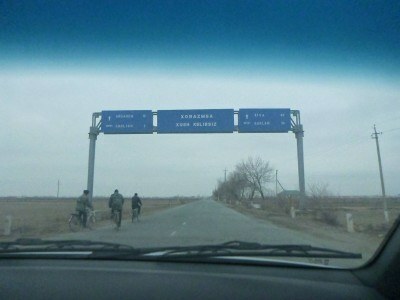 Again, this was insane, having just crossed into Uzbekistan from Afghanistan as well, some trip! 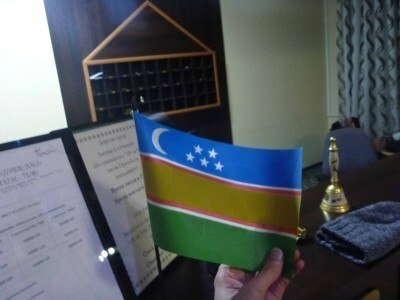 Where the duck is the Republic of Karakalpakstan? 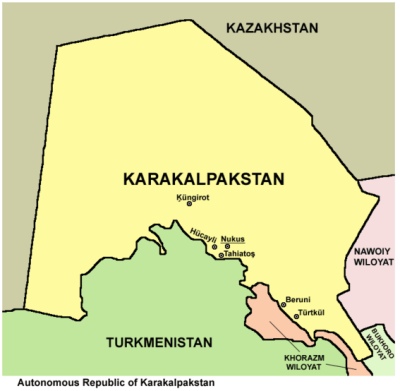 If you ever want to visit a “Stan within a Stan”, a good option is the autonomous region of Karakalpakstan. 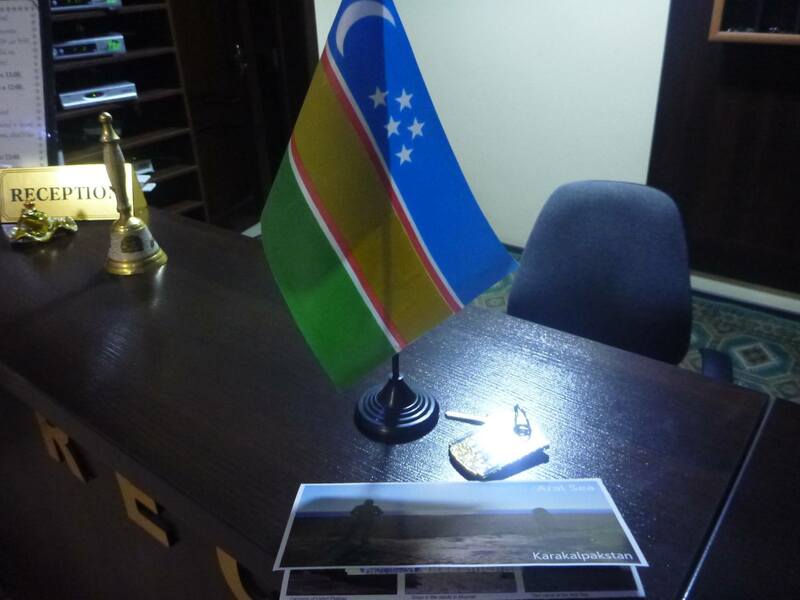 You don’t require any special visa or permit to enter this region. 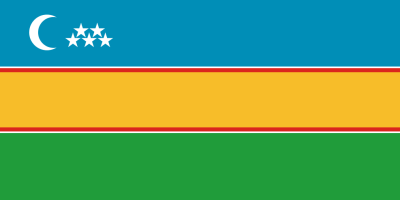 Your Uzbekistan visa covers you for Karakalpakstan. 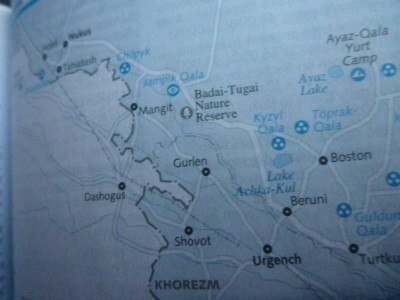 But this region is pretty damn remote and obscure. 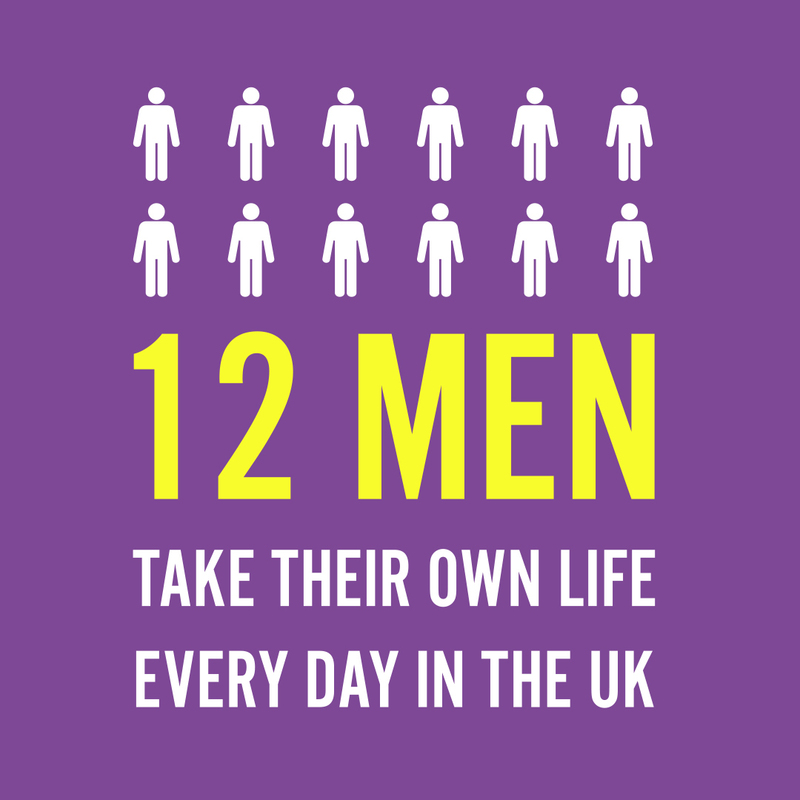 Although it houses a similar population to Northern Ireland, it covers a much wider area. It borders Kazakhstan and Turkmenistan and has its own language, flag and government. I had to get this place on my list so I headed here from the city of Bukhara. 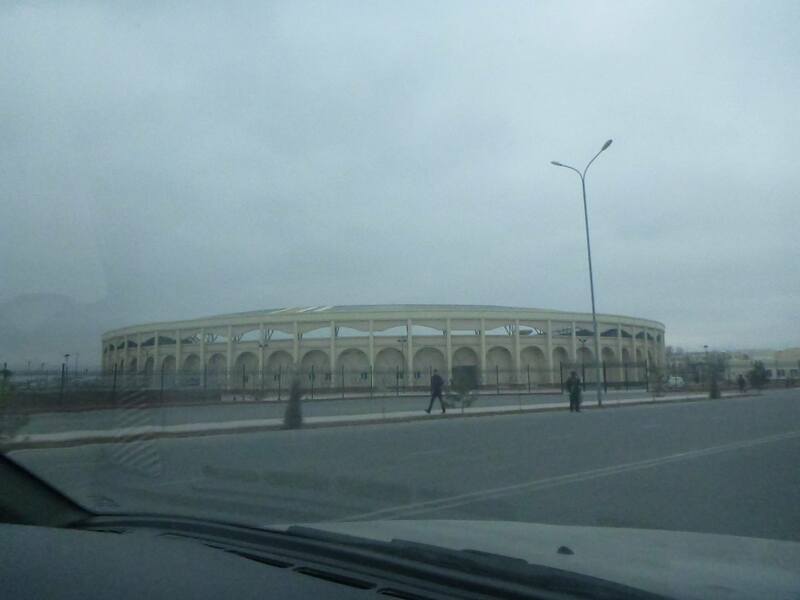 Bukhara is a popular tourist haunt in Uzbekistan, though oddly the place was a ghost town on my visit! All alone in Bukhara, ghost town! 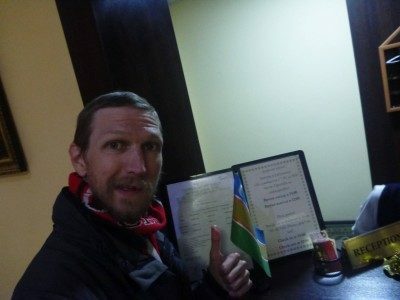 I stayed in Madina and Ali’s Guesthouse in Bukhara but I left Bukhara early in the day as by now I was used to the ridiculous culture of the lazy and slow Uzbeks. Time means nothing in Uzbekistan. In my life, its the most important thing we have – we must make the most of our time. In Uzbekistan, forget that, they steal your time here for useless things. It will just annoy me if I list all the stupid time wasting involved in Uzbek culture. People spend hours doing nothing. It’s the first country I have ever seen this happen in. 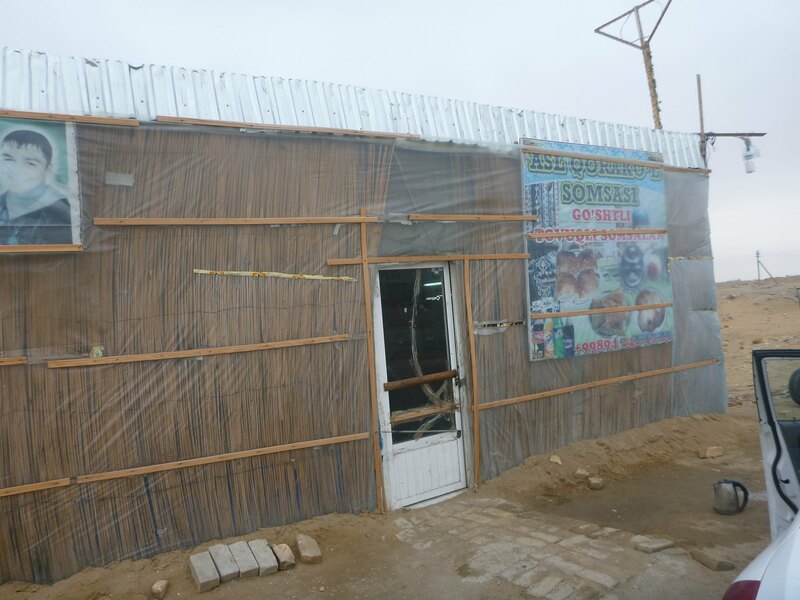 Everybody has some money due to the military dictatorship, so people get lazy. 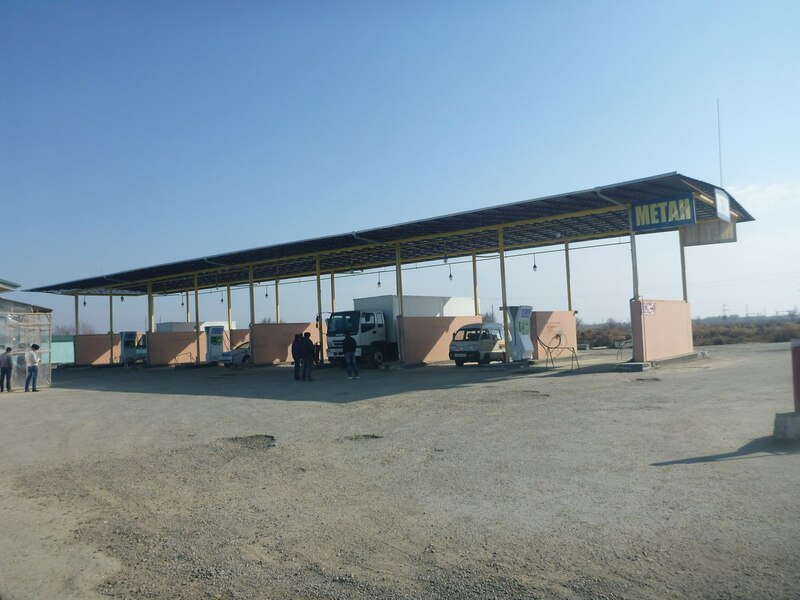 We stopped for petrol about 3 times. Once at the start would have done to fill the car up. Not rocket science, or bring a spare petrol container, as I did in Australia. A severe lack of common sense exists when you backpack in Uzbekistan! My driver speaks to his mate for about two hours at one point. I just sit in the same seat doing nothing, waiting to go. We stopped for smoke breaks and for the driver to chat to random people he knows in multiple towns. You end up sitting in the car for hours on end doing nothing. 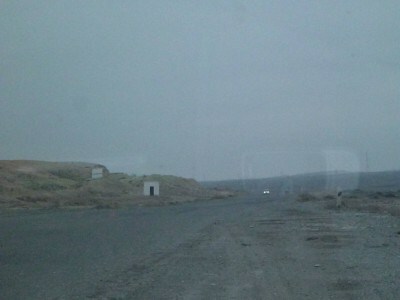 There is no URGENCY in the country, which is so ironic as we were heading to a city called URGENCH! 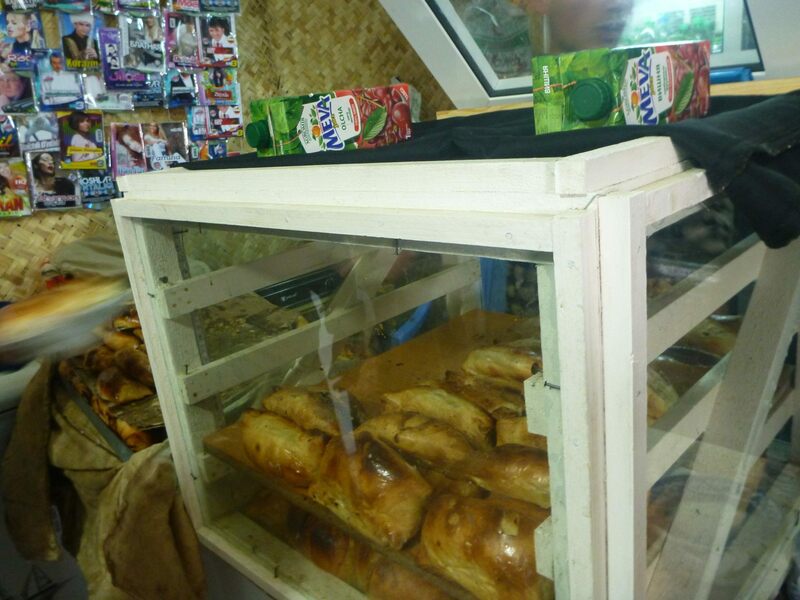 Half way through the afternoon, wee stop at a roadside hut and I’m not that hungry – I always carry food with me to eat in the car as I like to save time. 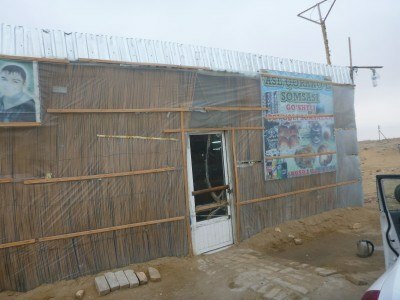 Uzbeks love to waste time, so I ended up eating here as well. I won’t waste time writing about what we did here, so here are the photos. Ah so that’s where we are – miles from nowhere. Miles from anywhere! 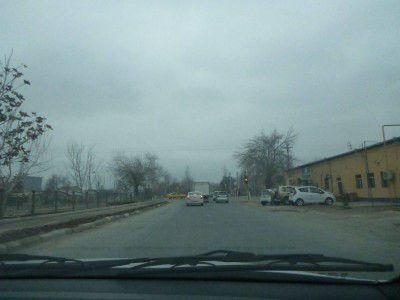 I had just over an hour in Urgench but most of that time was spent arguing with taxi drivers. It’s an old school Soviet era city with leafy parks, wide boulevards and massive buildings that will never be used. 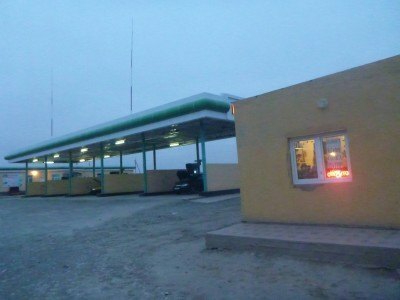 Urgench is the gateway to Khiva as well as being the transport hub for overlanders to Turkmenistan and Karakalpakstan. 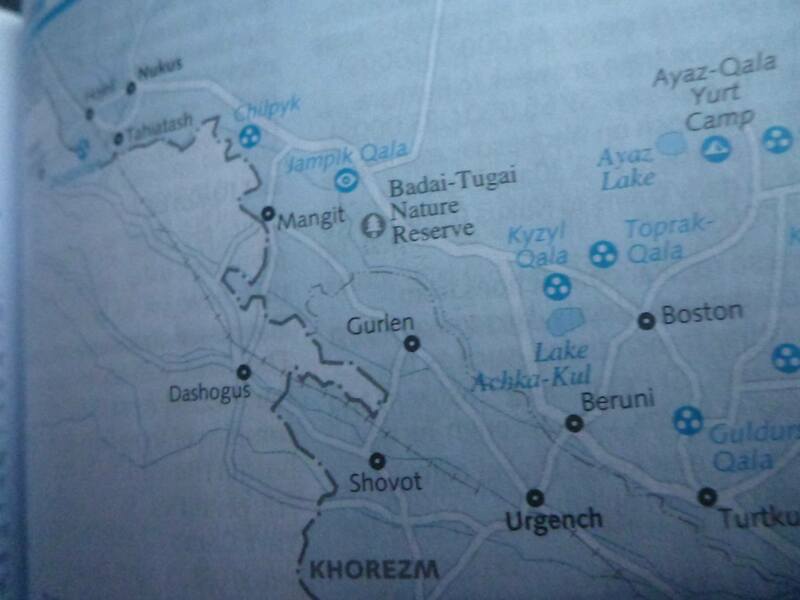 Urgench is in the Khorezm region of Karakalpakstan, the map below shows my route to Nukus, which was via Beruni rather than Gurlen and Mangit. 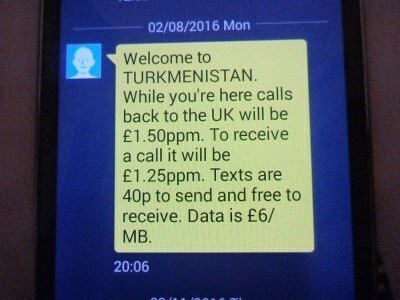 Incidentally Mangit sits on the Turkmenistan border, so my UK mobile phone changed networks. 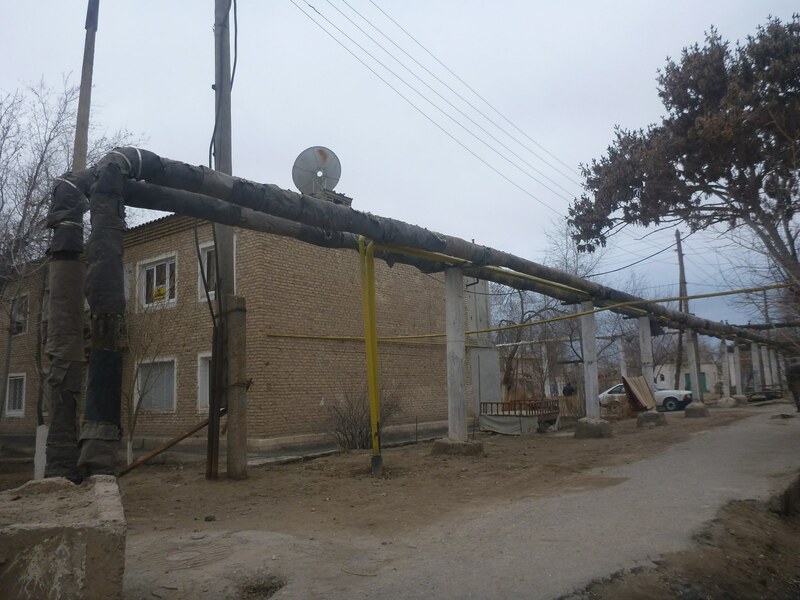 Urgench has too many bus stations so it gets confusing. 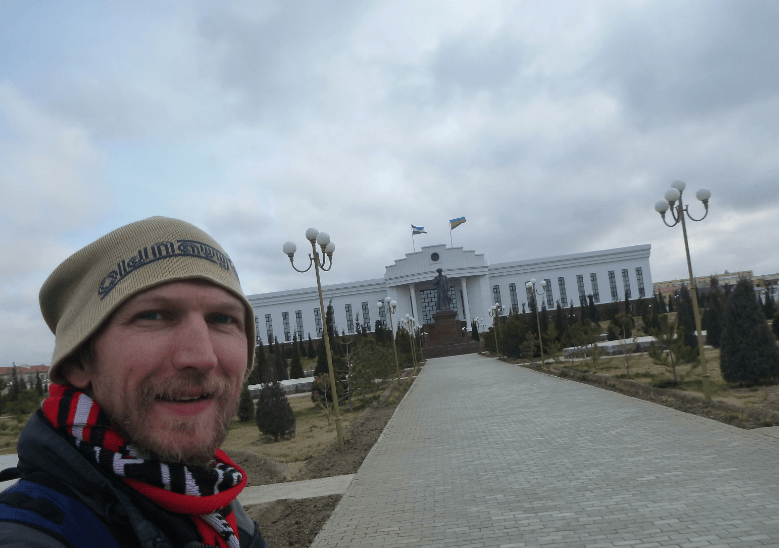 I didn’t even ever stay a night in Urgench, but I was able to tour the city by default on my two trips in and out – mostly I was seeking bus stations, taxi shares and any onward connection from a driver that wasn’t rude or a rip off merchant. Good luck. 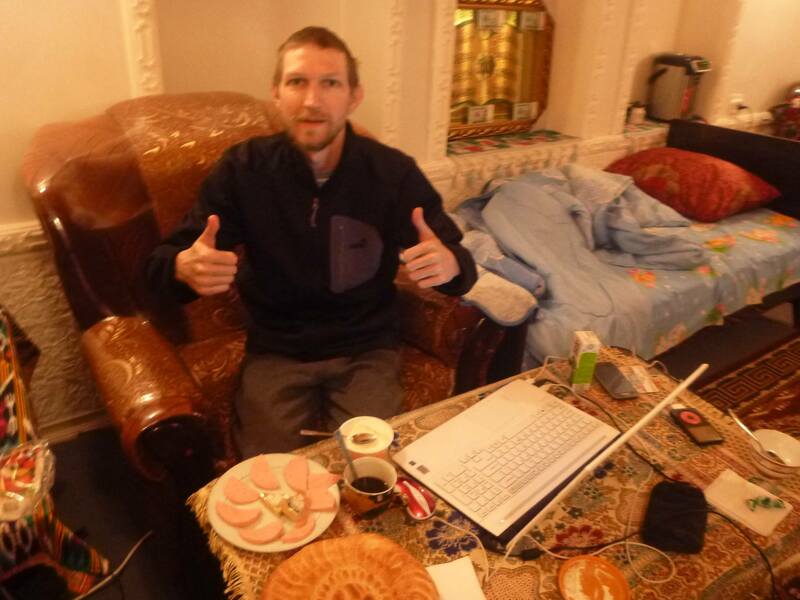 Urgench is nothing to write home about. 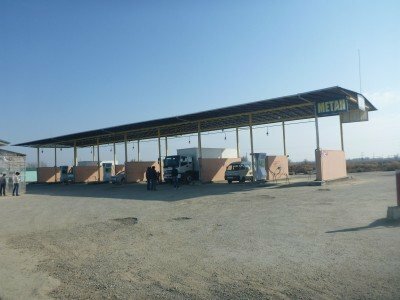 But it is the last stop in mainland Uzbekistan before the wacaday drive to the Republic of Karakalpakstan, so you’re very likely to stop in Urgench on route. 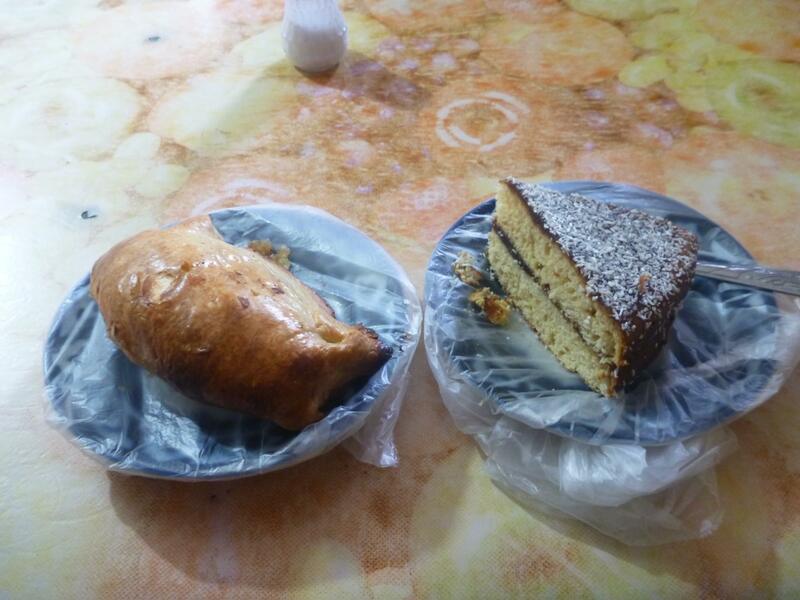 I decided to head to Nukus in Karakalpakstan for quite a few main reasons. 3.My Uzbekistan visa time was limited to 11days and in a slow, lazy country time was running out so I didnt have time to travel further into KP. 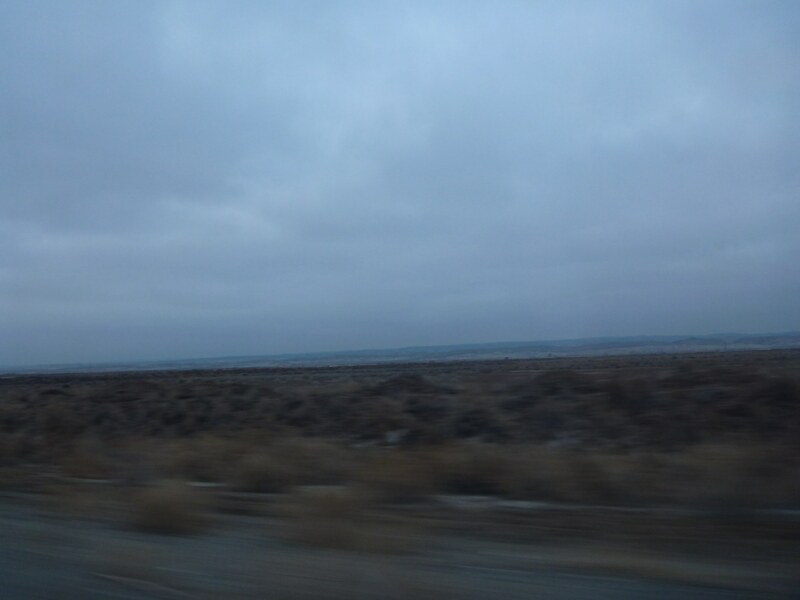 Nukus is only a 3hour drive from Urgench. 4.Its well connected by train, bus and shared taxi. 5.It houses the Savitzky Museum. The world’s best art museum. Number one. Soviet style residential estate in Urgench. Wacaday! 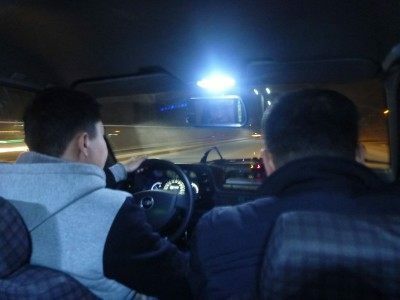 When leaving Urgench I try to bargain with the taxi drivers. You need patience and a harsh verbal tone when chatting to these guys. 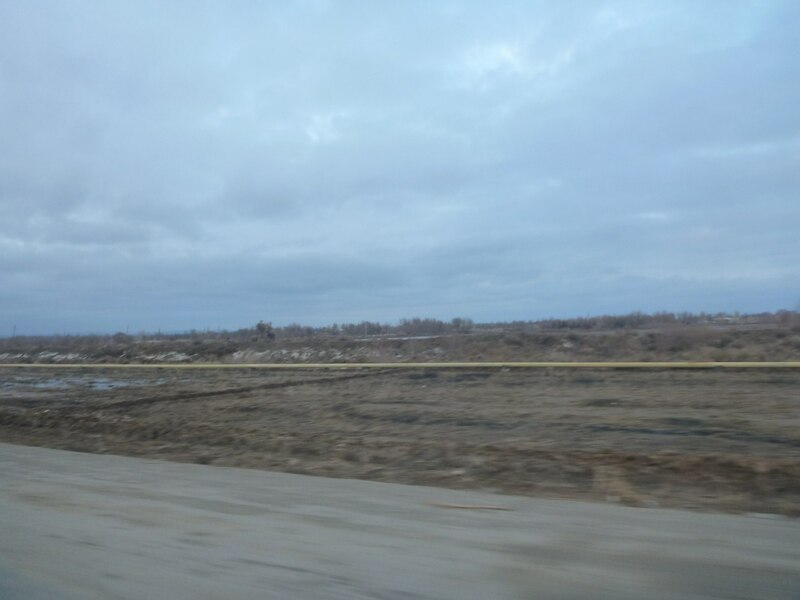 Finally we agree on 25,000 Som ($4USD) per person from Urgench to Nukus. 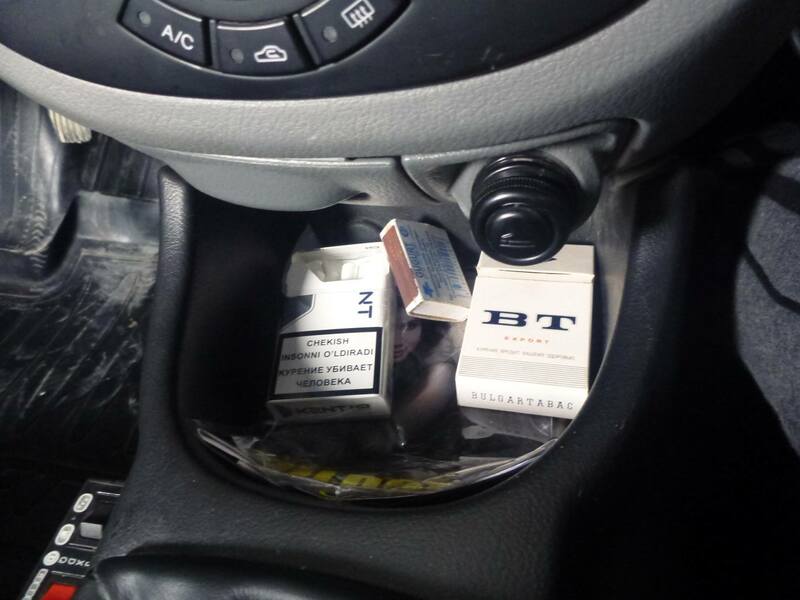 The problem is the car isn’t full and I want to leave soon. 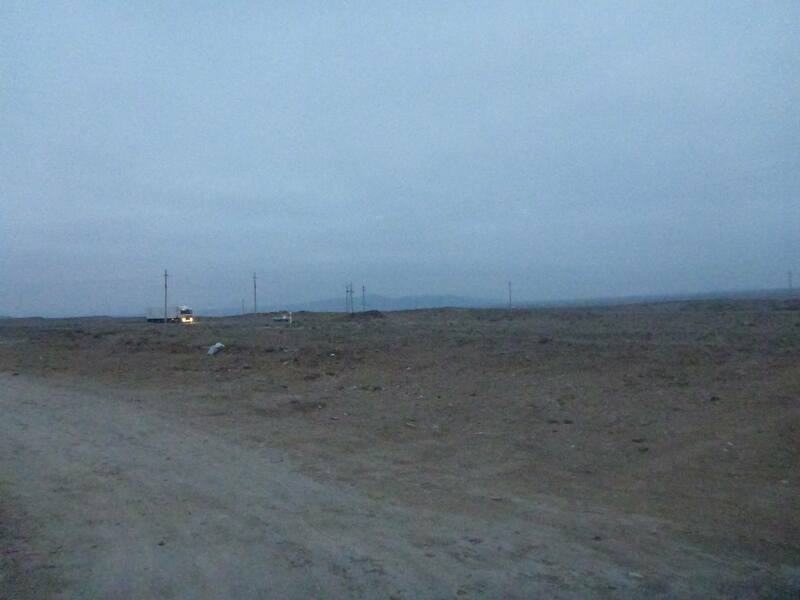 Daylight is fading so the chances of making it to Nukus for sunset have gone. 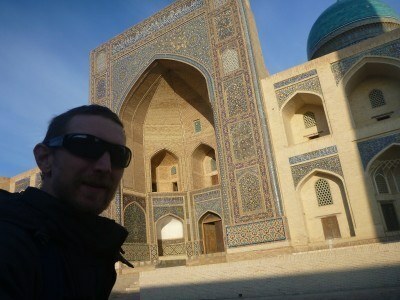 Again, not my fault, it’s the slowness of travelling in time wasting Uzbekistan that steals your sunshine here. But still, $4 US seems a bargain now when I look back at how Wacaday this journey was! Then the driver gets a phone call and at the same time a dude with a bottle of whiskey joins us. It seems he is a mate of the driver! He swigs whiskey direct from the bottle like there’s no tomorrow. This is pure lunacy! Wacaday! We leave the Olympic Stadium area behind and are soon in a side street in what to me is a Soviet style equivalent of a British council estate. 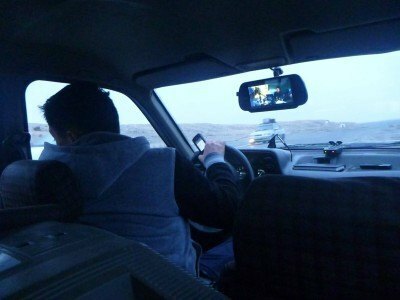 With whiskey boy swigging away in the front and Northern Irish backpacker eagerly anticipating the border crossing, a man carrying a huge grey TV saunters down towards the car!! I snapped a photo of him as he carried it. This is classic backpacking at its best. The TV doesn’t fit in the boot so we sandwich it in the middle seat between him and I and off we go. My travel buddy for today is a 16 inch 1990s TV!! A TV that the dude is exporting into the Republic of Karakalpakstan! Corker of a time even if we are wedged in! 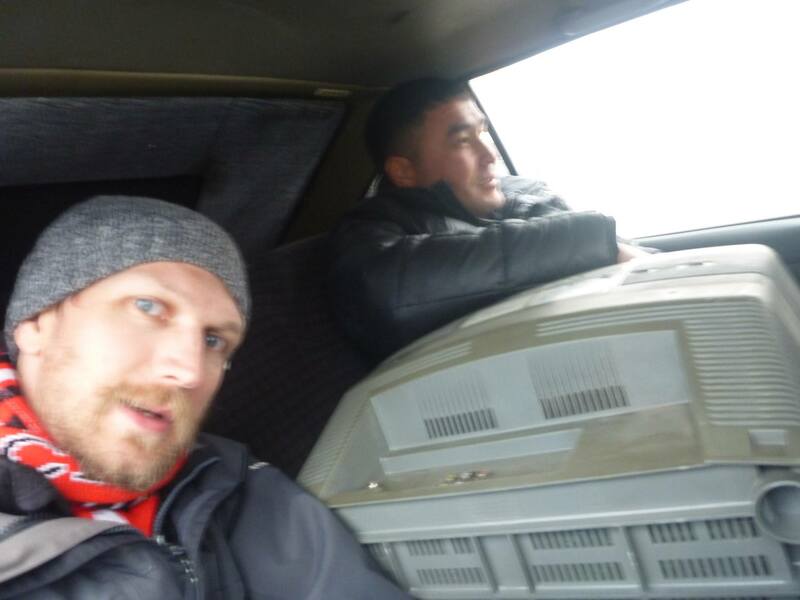 My travel buddy is a 16 inch 1990s TV that the dude is exporting into the Republic of Karakalpakstan! 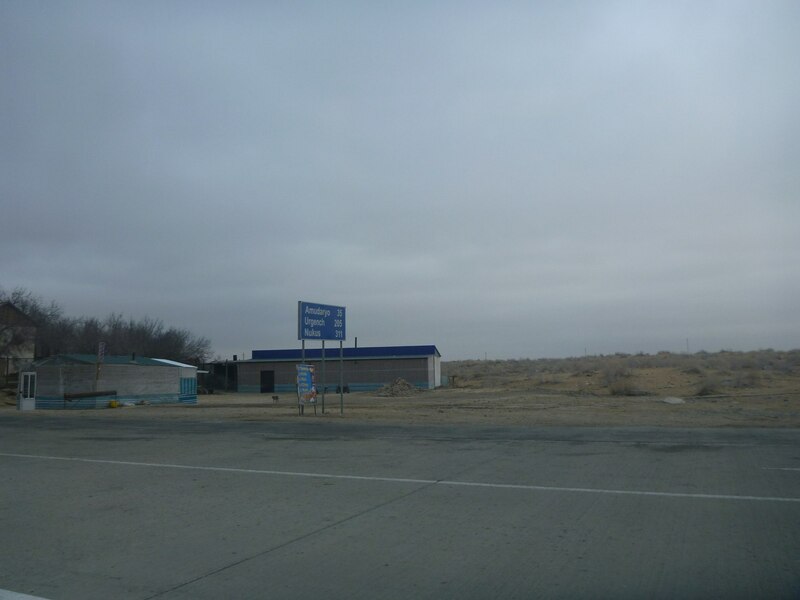 We have only one stop on the road to Karakalpakstan and one thing stands out straight away – it’s deserted and relaxed here. It’s so remote. It’s so much more deserted and remote than the rest of Uzbekistan. The other three guys in the car are all from Karakalpakstan. 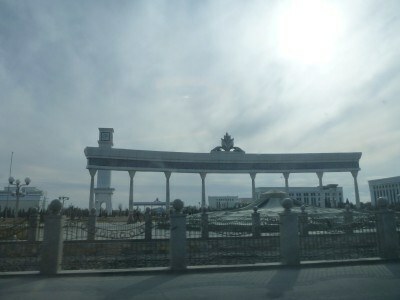 They are Karakalpaks. 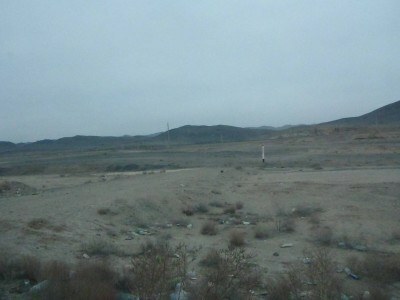 The Television is Japanese but licensed in Uzbekistan. I am Northern Irish with a visa on my Irish passport. There are no visas or border checks except one car check leaving Urgench and one on arrival in Nukus, Karakalpakstan. That’s right – no visa needed, no passport to be shown and no bag check. 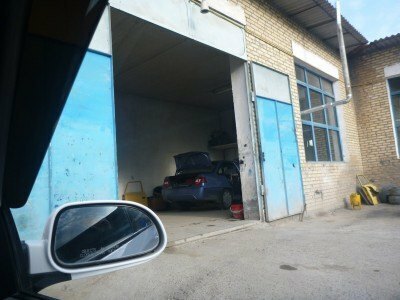 This is a different world from the rest of Uzbekistan where my passport would be checked about 5-6 times on average a day for what reason I don’t know. Here, I felt free again. “Freedom, I won’t let you down.” – George Michael. Whiskey boy takes another swig, offers me some. I decline. 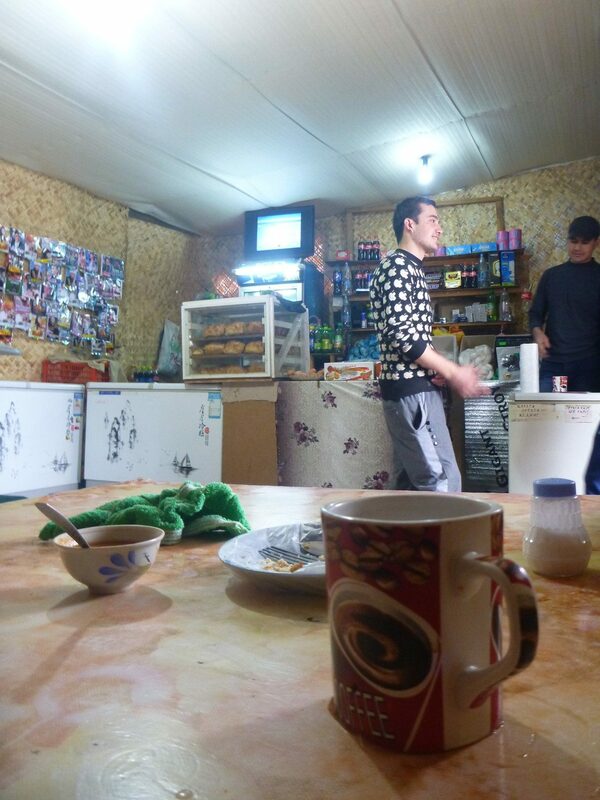 His mate bullets on some pumping Karakalpak jazz music, the TV is still in between myself and TV export boy, and we endure the bumpy ride through Karakalpakstan. 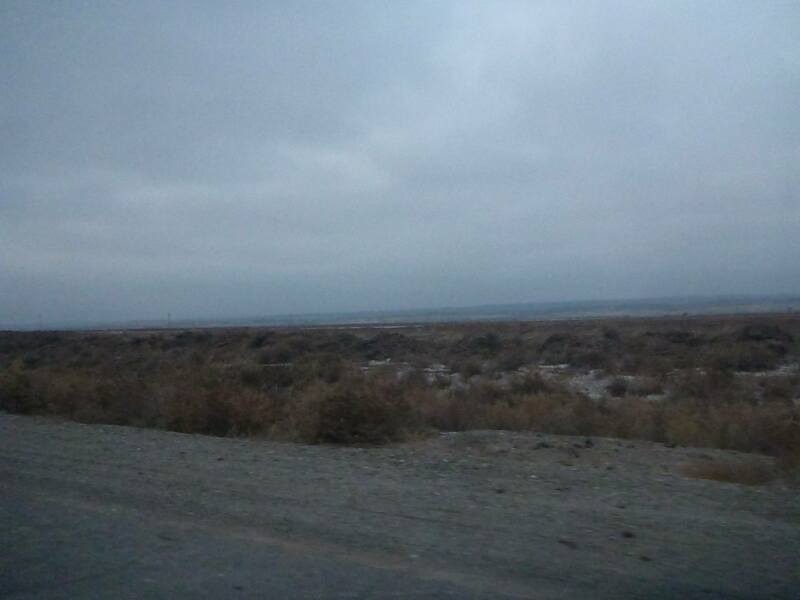 It is bumpy but before the sun sets, I’m glad I could sample some of the Karakalpakstan countryside. 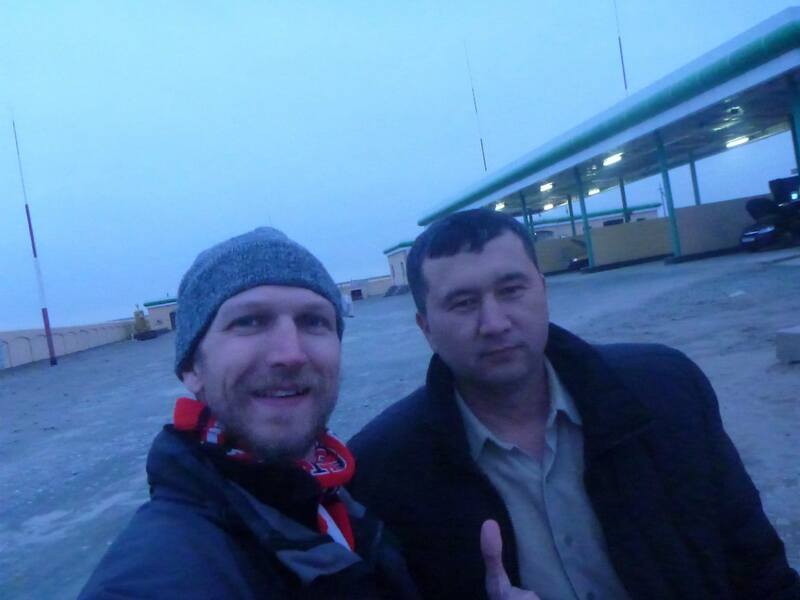 The Karakalpak guys only speak Karakalpak, Uzbek and some Russian. We try to chat in broken English and at least they understand I’m a tourist and where I’m from – Severn Irlandia, Northern Ireland. 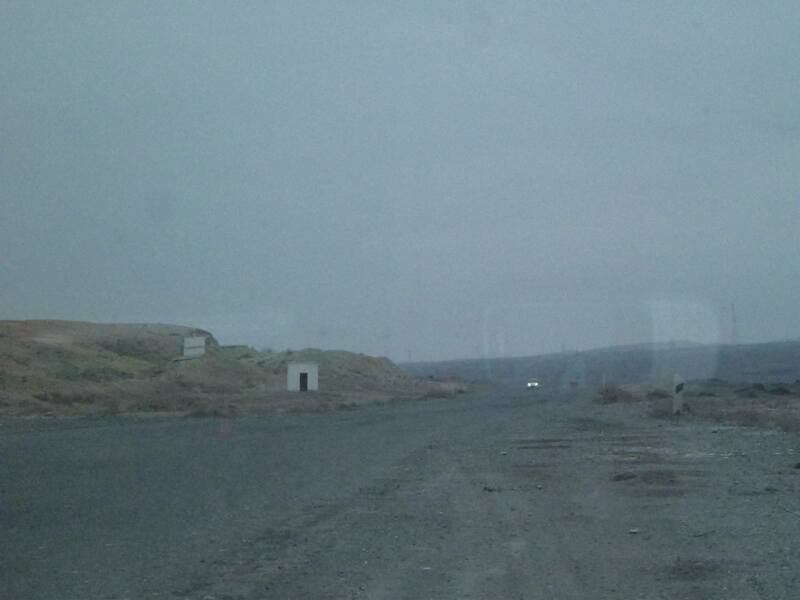 Knowing I’m excited about travel, the driver points out a narrrow stretch of road which has the Turkmenistan border behind it. I didn’t feel sad to see this. I will go there someday. But on this trip, I didn’t fancy the cheating option of popping in and out on a transit visa to tick it off. 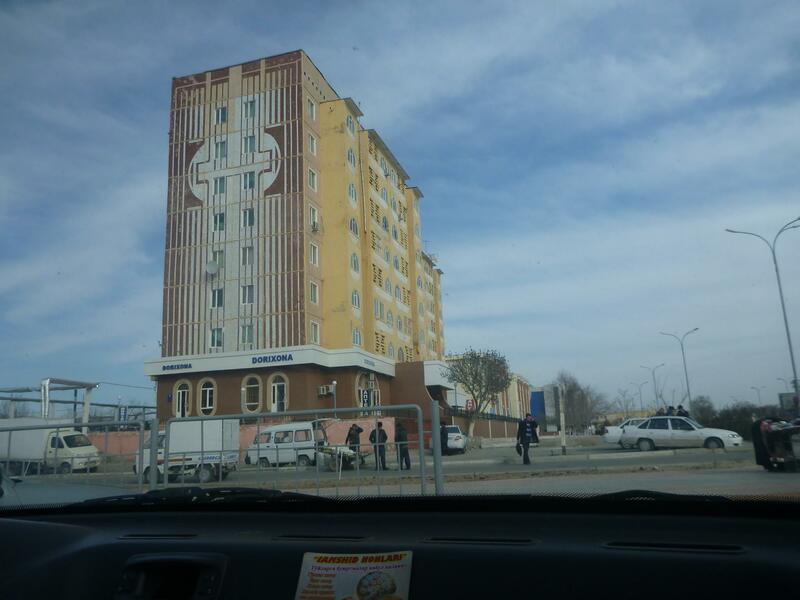 Even a Turkmenistan Transit visa is hard to come by. 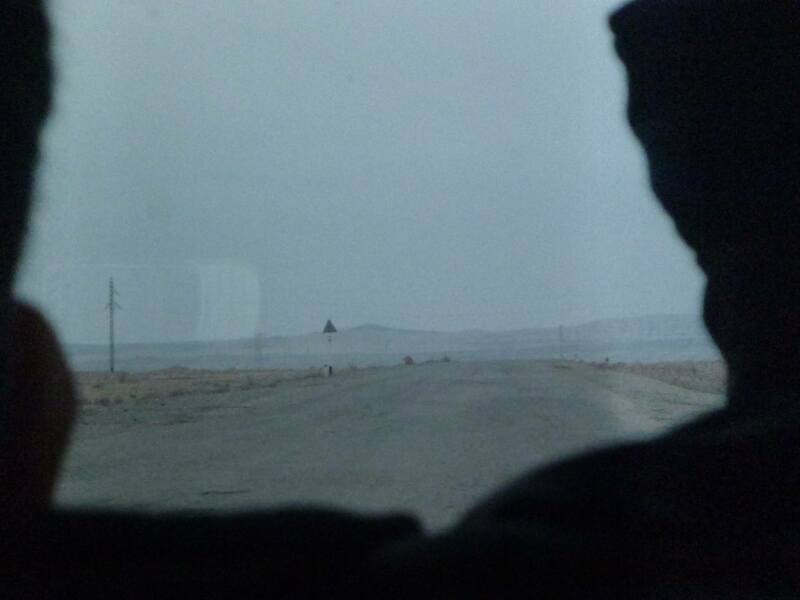 When we make the stop, Turkmenistan lies in the distance, only a few kilometres away from me. The only time we get out of the car is a bit after the checkpoint departure from Urgench. It is here we top up with petrol and I breathe in my first sample of Karakalpak air. 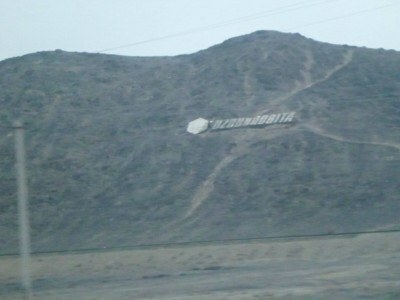 There is a sign with something about Uzbekistan on it on a hill, everything beyond this is wilderness. 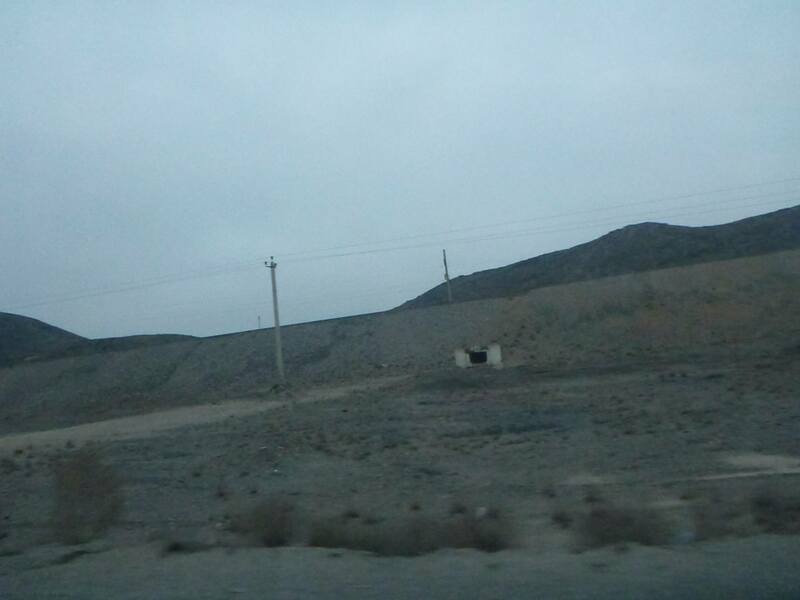 We are now in Karakalpakstan. We get out of the car and our driver fills it up. In Uzbekistan (and therefore Karakalpakstan) it is illegal for a passenger to sit in a car while petrol, gas or oil is being added to it. At this point, I talk to whiskey boy and he takes a photo of me. 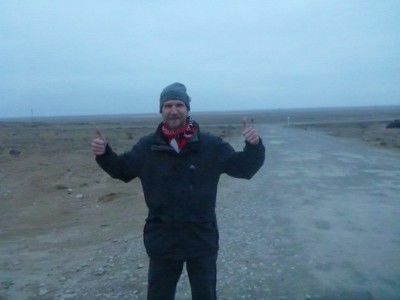 Jubilant and standing in the wilderness here in Karakalpakstan, nearest I have ever been to Turkmenistan in my life. 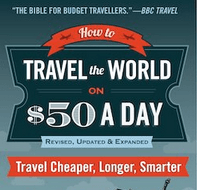 And another new Wacaday Republic to add to my travel repertoire. We get a selfie together and the daylight has begun to fade, it must be around 6.23 pm. 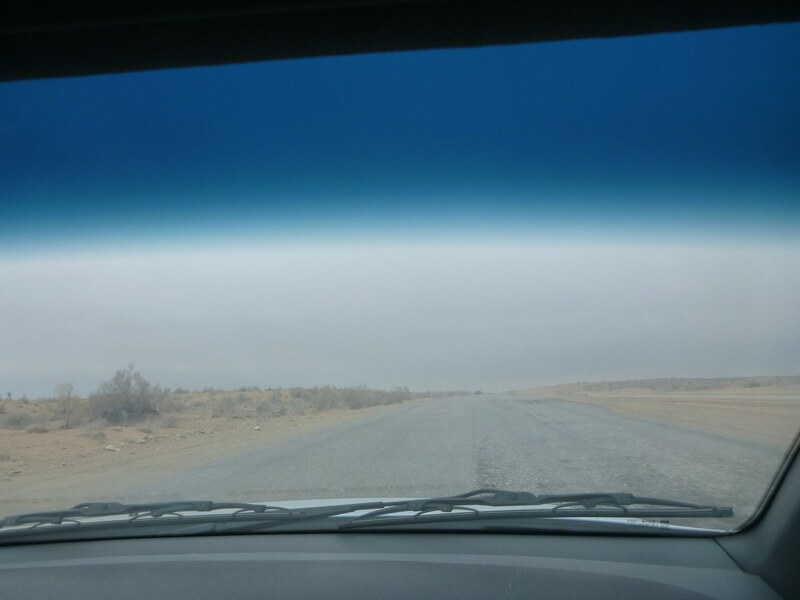 The next part of the road is bumpy, straight and direct. 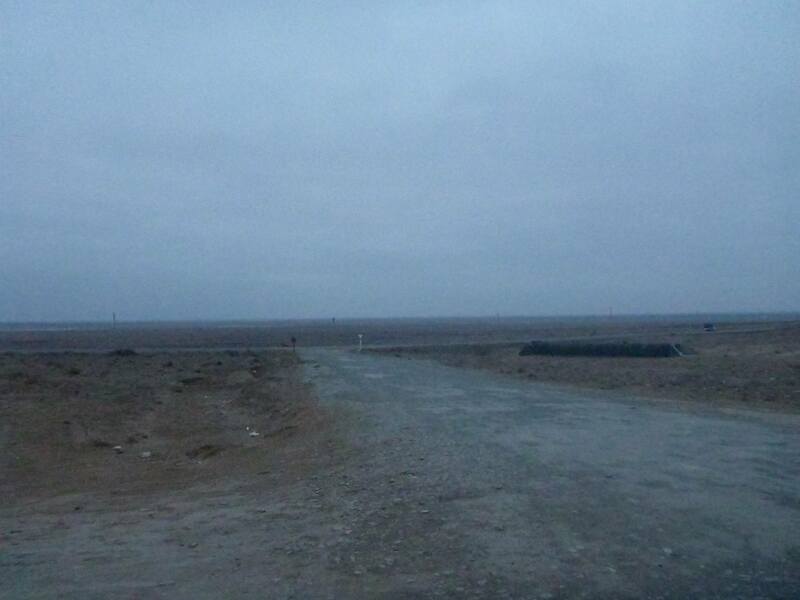 There is only one obvious road here all the way to Nukus. 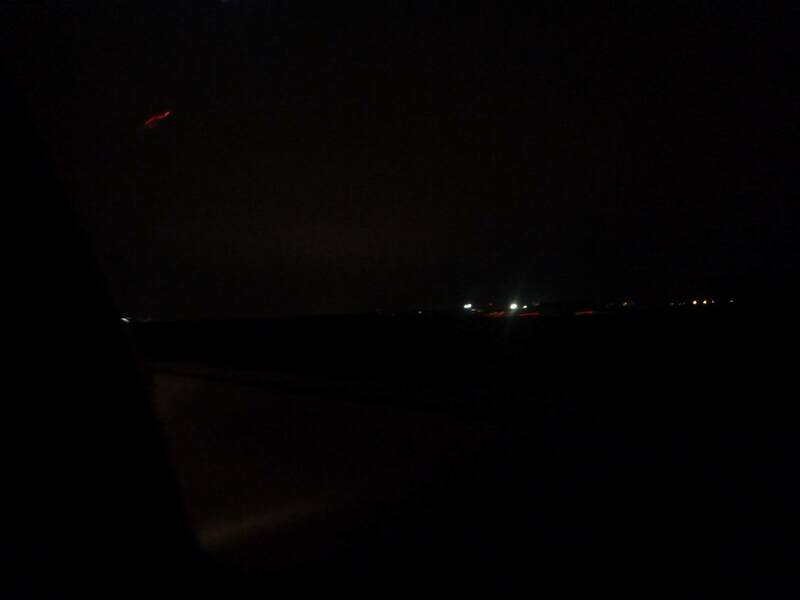 It’s pitch dark when we arrive in the low lighted city of Nukus. It seems so desolate, lonely, deserted. I’m completely inspired and overaud by this. I felt a sensation of joy here. Something good was happening in my life. We arrive in Nukus, sometime after 7.30 pm, I’ll be honest I don’t really know the exact time. I didn’t take any notes, or check my watch or work out if it has the time set to the same as Uzbekistan. But I was in Nukus and it was dark. 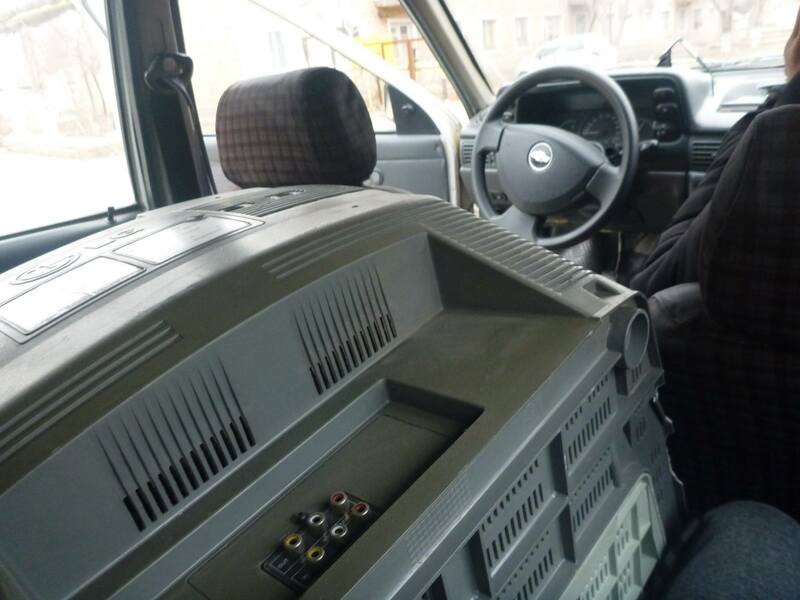 First up we drop off the TV smuggler to another random house in a Soviet era council estate. 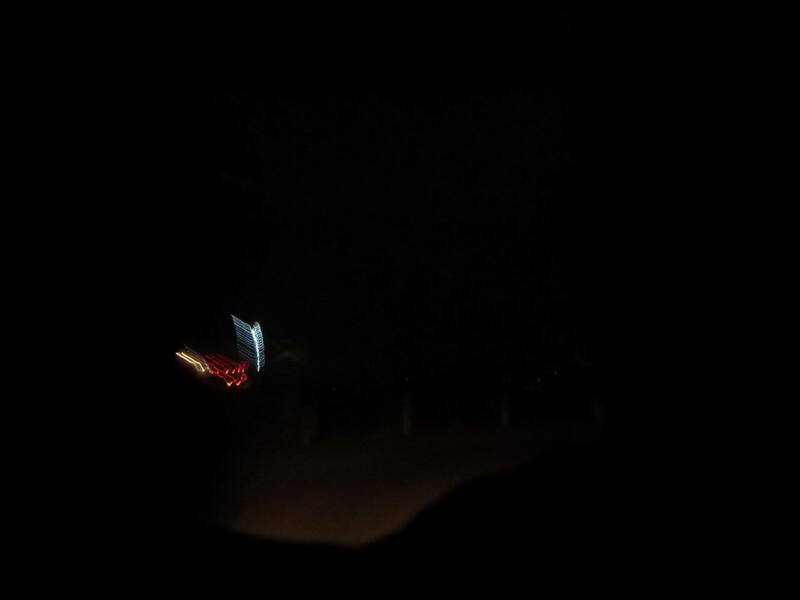 It’s too dark to see anything, but he leaves. I bid my farewell to him and I have a back seat all to myself. 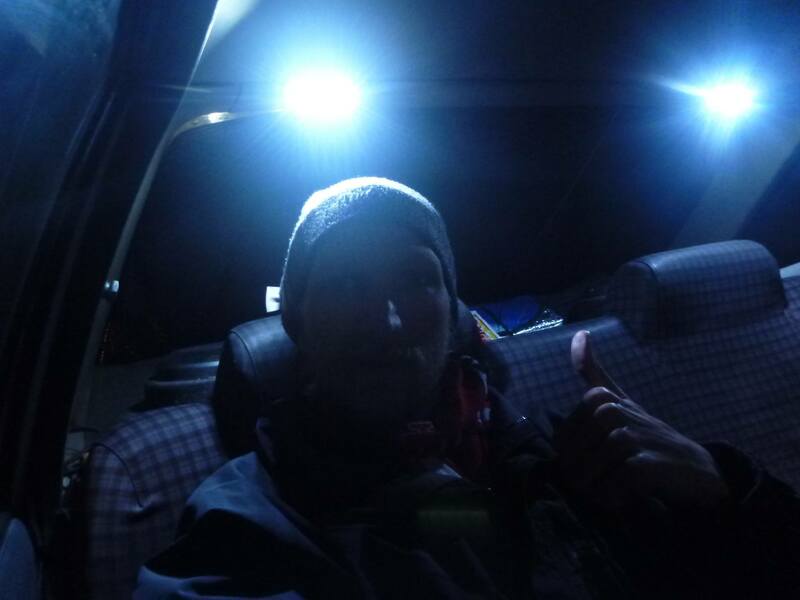 Admittedly my bum and left leg are a bit sore from the bumpy TV ride all the way here so it was nice to have the whole back seat again. We make a further stop for the driver and his mate to buy some beer! 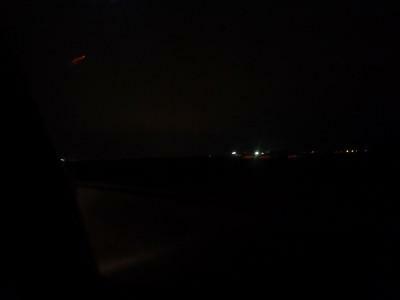 The city at night is deserted. It reminded me of nowhere specific I had ever seen before but a mix of places. 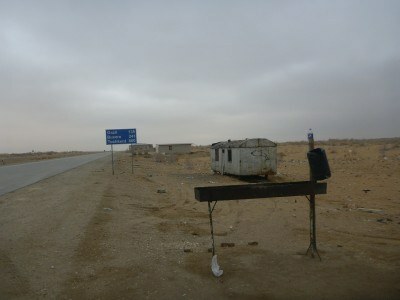 It kind of felt like a mixture between a Soviet era Ghost Town, a desert village in Iran and a remote city in China. 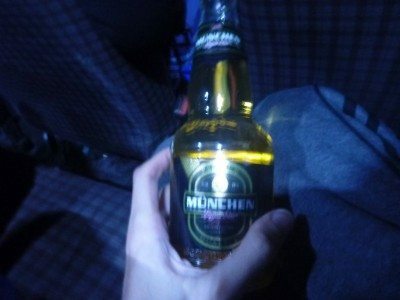 The beer they chose was Uzbek made but with a German name and recipe – Munchen. 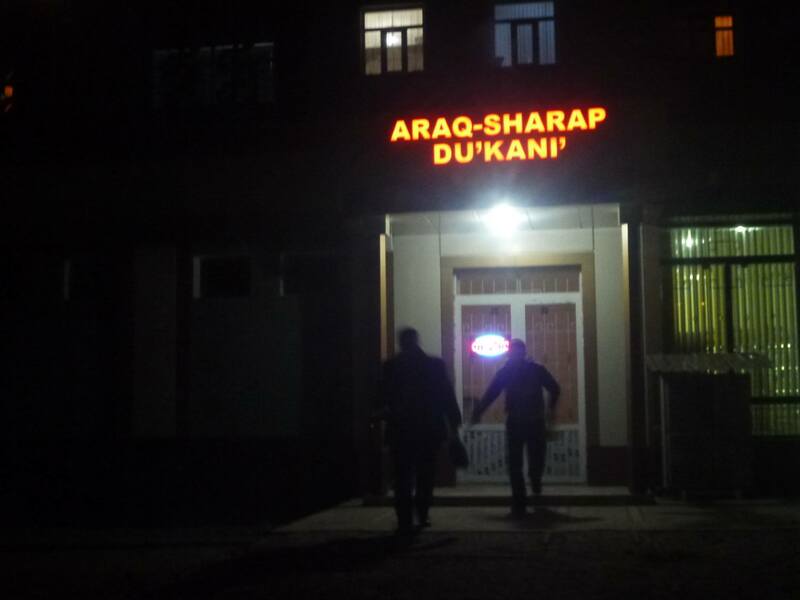 I preferred to wait until later as I wanted to try some authentic Karakalpak beer. My journeys in life are pretty spontaneous. If you had asked me in December 2015 if I would have backpacked through Afghanistan, Gorno Badakhshan and Uzbekistan by mid February, I would not have believed you. For this reason, I hadn’t booked any hotels or hostels to stay in here. I planned the trip the day after I came back from Afghanistan. 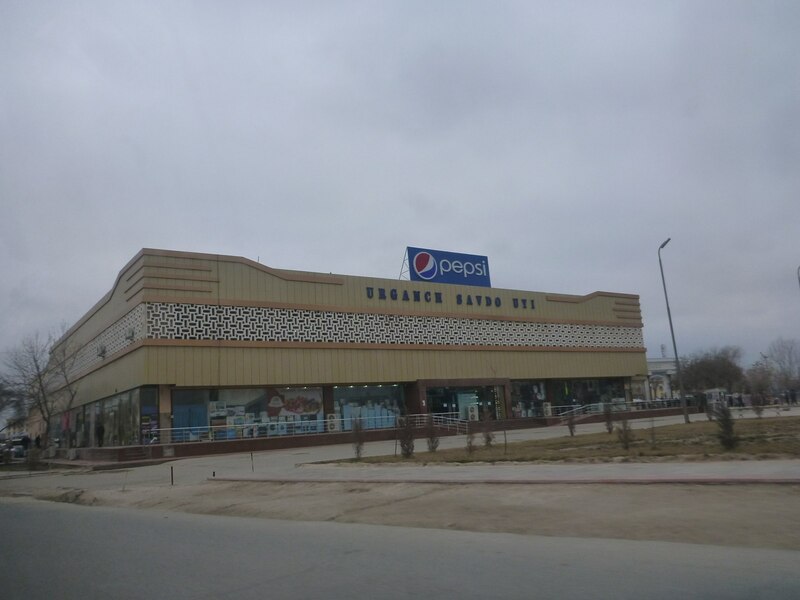 So I hadn’t booked anywhere to stay in Nukus. I knew there wouldn’t be a shortage of beds though. In 6 of the previous 7 places I had slept in Central Asia, I was the ONLY tourist in that hostel/hotel or guesthouse! I spied out two potential places and my driver agreed to take me to Jipek Joli Hotel, to drop me off right at the door. 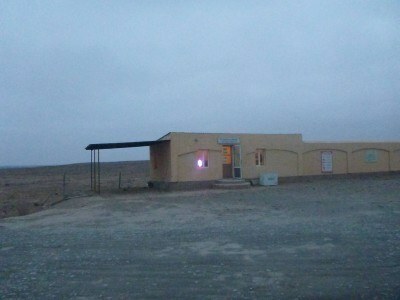 This place was advertised as the best budget hotel for tourists. I didn’t expect much. 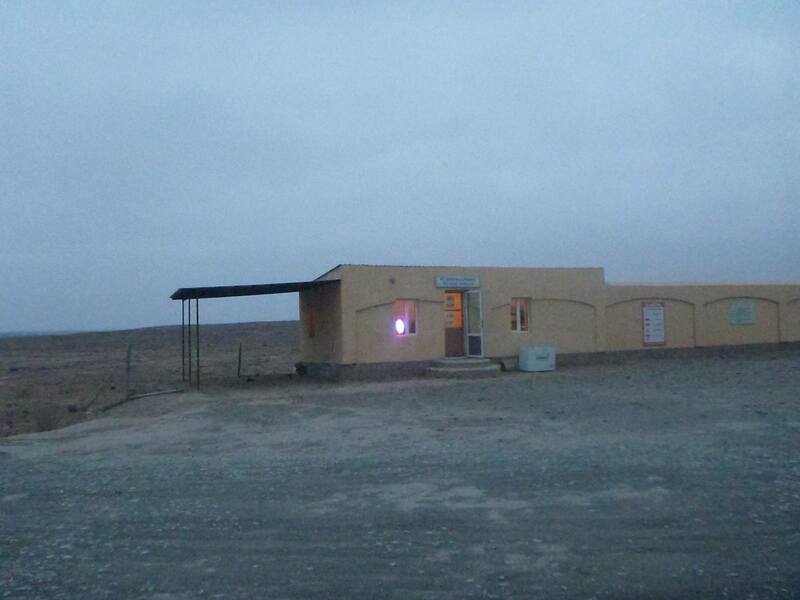 I expected cold water showers, no WiFi, average breakfast and at best a smile from the staff. I was completely wrong! The Jipek Joli Hotel was superb and a great deal – one of the best hotels I stayed in in Central Asia. I’ve made it to another crazy Republic! Karakalpakstan! I said goodbye to my driver, paid him and got a photo outside my hotel with the famous Karakalpak boozing boy. I had arrived safely and happily in the capital of the Republic of Karakalpakstan ready for a night on the rip, a bit of blogging and a day of backpacking the sights of Nukus. Yes, this was a wacaday journey! This entry was posted in Central Asia/Middle East, Karakalpakstan, Micronations, Nukus, Urgench, Uzbekistan, World Borders. Bookmark the permalink. 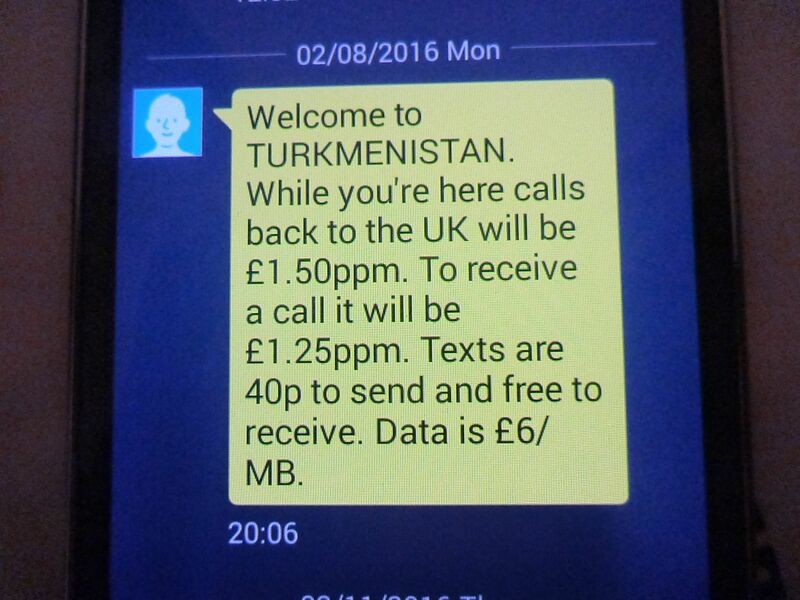 Oh man, Uzbekistan sounds like hell. Hope you make it through in one piece! Saw that you were in Singapore a little while back. We have a spare room next time you’re in the lion city. Jonny Blair, you too fast on doing conclusions (wrong conclusions). 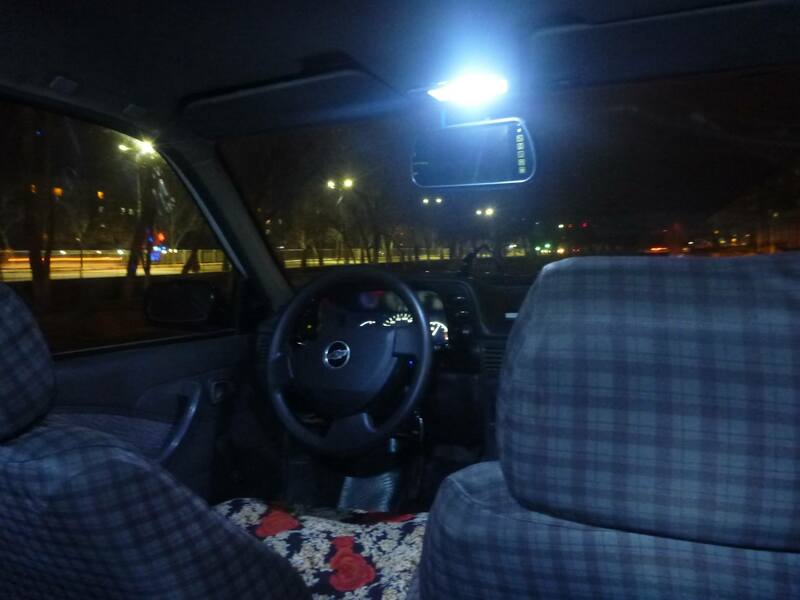 Your taxi made 3 stops because it runs on gas, one ful tank of methane gas maximum can last for 250 KM, that’s a reason. 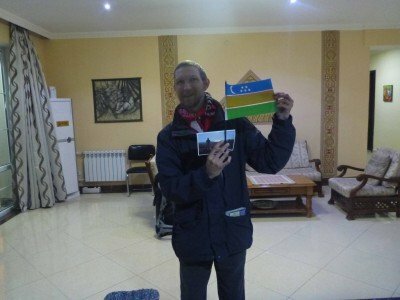 Then why the Uzbek people they should know about Amazon, e-bay, if we don’t use it, we don’t use it we have our style amazons here that you don’t know. 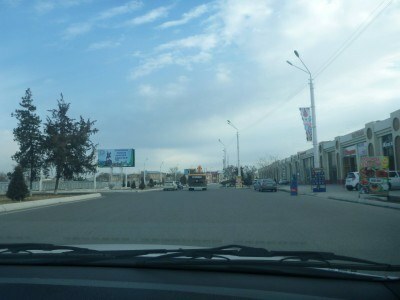 The main thing did you feel safe here in Uzbekistan, the people were very welcoming and hospitable? I think and hope yes. That is the main thing. 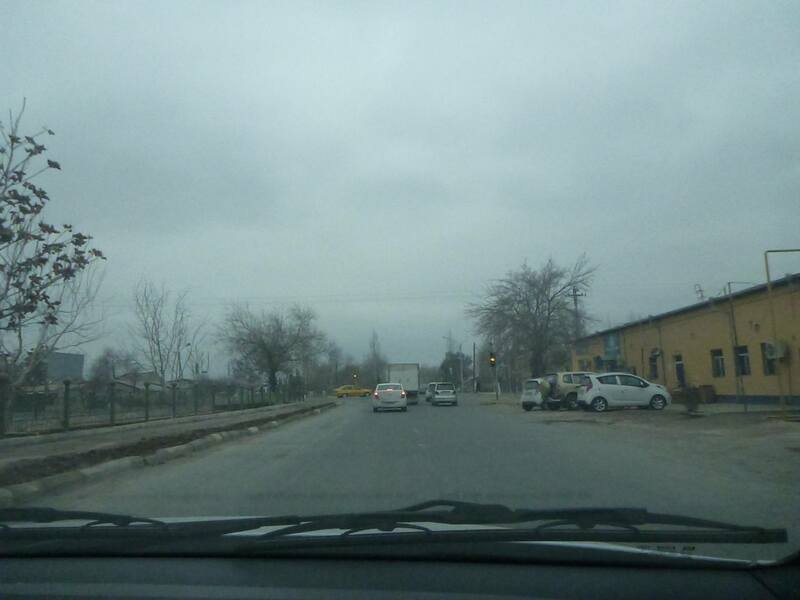 The measures of safety and security they are high, but do not forget that UZB borders with Afghanistan, Tajikistan, and so on, and one could thing and admit that these measures are approved. 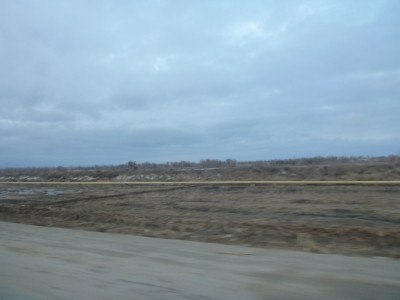 Then you visited UZB in off season, otherwise you could not even find a place to stay at places. The last thing you got all that you paid for. 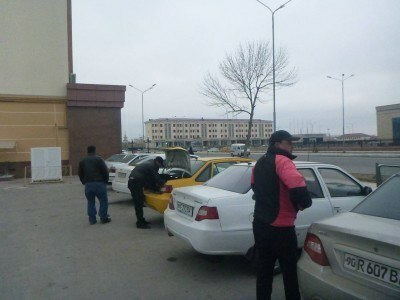 For instnace: If you had paid to that taxi driver 100.000 sums right away, he would have brought you up to Nukus in one hour and half. 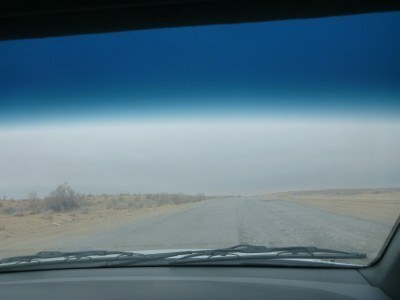 I think 16 USD for 200 km not so bad deal. My dear friend be more positive when you travel. If one does not know the reasons why it’s like that i think he has to be a little careful on doing conclusions. 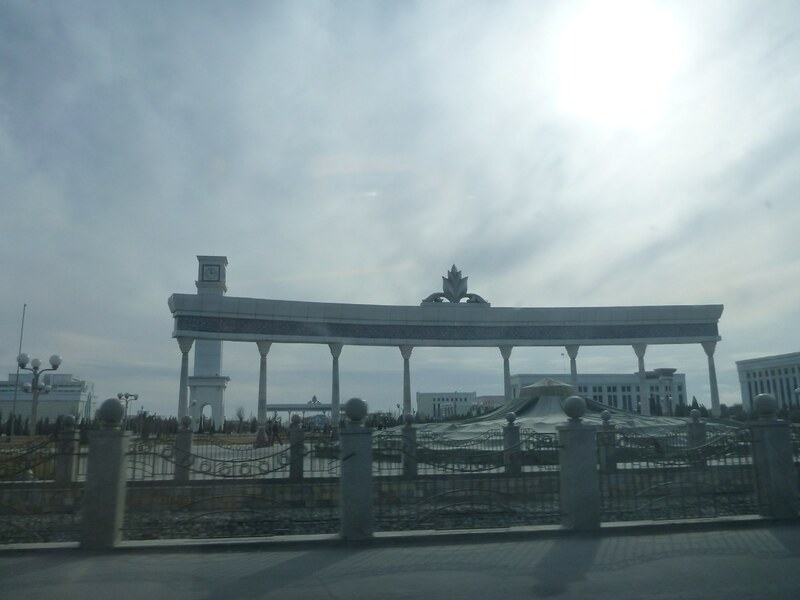 If you need any clarifications, have any questions regarding Central Asia, you are welcome ! It depends, Jonny. 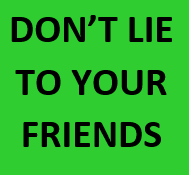 Most probably you got the wrong time and wrong people, I don’t know, my taxi drivers they never do all that, pipi stop on the road it could be, most probably he is not a taxi driver at all, becasue I know the taxi drivers, they have alwasy rush to do some more money. Not all 5 fingers same they tell in our country. If You don’t welcome the world, if you want to find Europe high standarts everywhere why you travel and complain, isn’t it better stay at home and feel comfortable. If I travel to England and N.Ireland for sure me too I find so many odd things. Be more positive ! For you europeans it’s OK to see in european cities (Paris and in Belgium for instance) Millitaries with machine gun guarding the streets (due to the recent events) but if you see severe checks, and 2 police in our countries you give them all political words. And now one question: How many people die every year in you country because of street gun shootings? Or in USA, or in any Europen country? 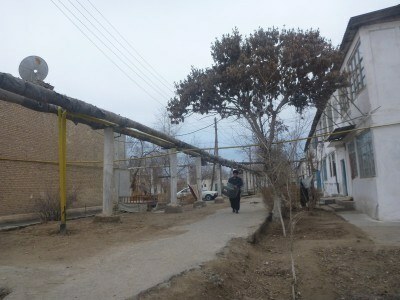 I tell for UZB, it’s 0 ZERO, we do not have street gun shooting, knife stubing and ect. You guys see the world through BBC and CNN. You talk about democracy – Look to Iraq, Syria, Egypt, Libya, Yemen, Democratic countries they brought democracy to those countries. If US, and Europe represent such kind of democracy we do not need that. 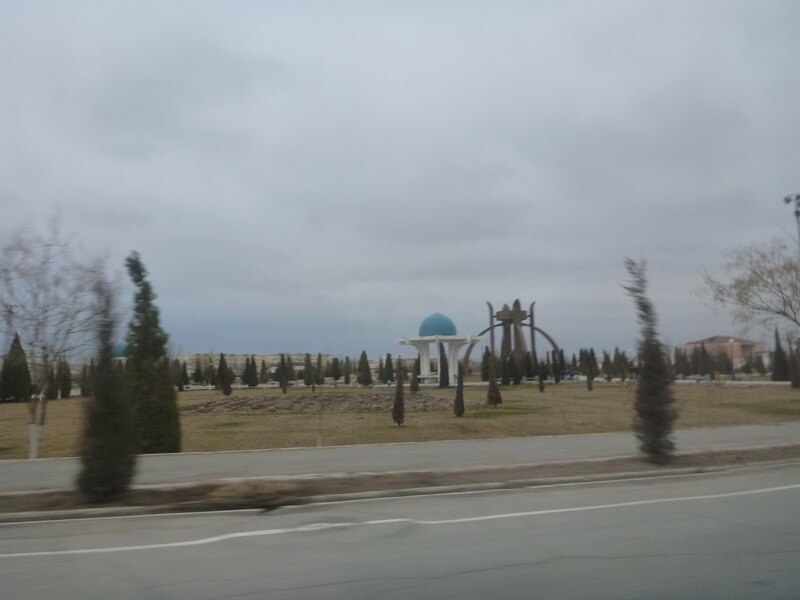 If you call Uzbekistan has nothing special, so you don’t know nothing about geopilitics. That’s even better, less you know better you sleep. Don’t get with me for this comment, sorry for that in advance. It’s just my opinion. Have safe, trips! If you want people follow you internet site, be more ballanced, fair and positive. I do understand there are a lot of positive and negative things you meet while travelling. 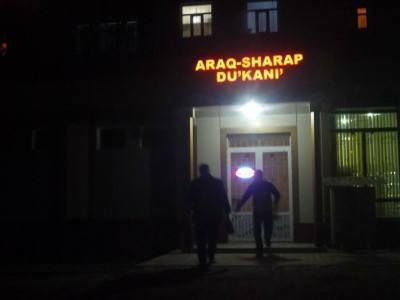 But reading too much bad things, it’s very annoying and at the same time I think it’s not fair towards the guesthouses that they were very hospitable and offering you something on special conditions, because they also Uzbeks, Tajiks, Kazakhs, Afghans, Iranians, Kyrgyzs. And they live earn money because of tourists like you travelling on their own, not big tour groups because they go to big 3-4-5 star hotels. If young people read your negative conclusions, feedbacks they never travel here and these people are left without business. Yes I admit checks, controls are severe and tough, slow here, but what we have in response – security and safety, low criminality. I’m sure that you prefer wasting you time rather than being robbed, or having troubles. If you mind my all thse writing, starting this point I stop doing it. Be safe ! My only hope is that the television set wasn’t a free loader and chipped in its $4 US for the drive to Nukus. But to go back to Bek’s comments, I view Jonny’s post as his own personal viewpoint – nothing more nothing less. 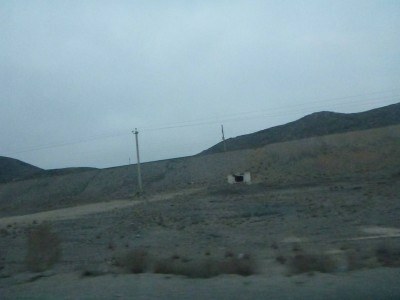 I could go to Uzbekistan a few months from now, and have the complete opposite experience (e.g. more tourists, over booked guest rooms, faster taxis, less passport checks, etc.). 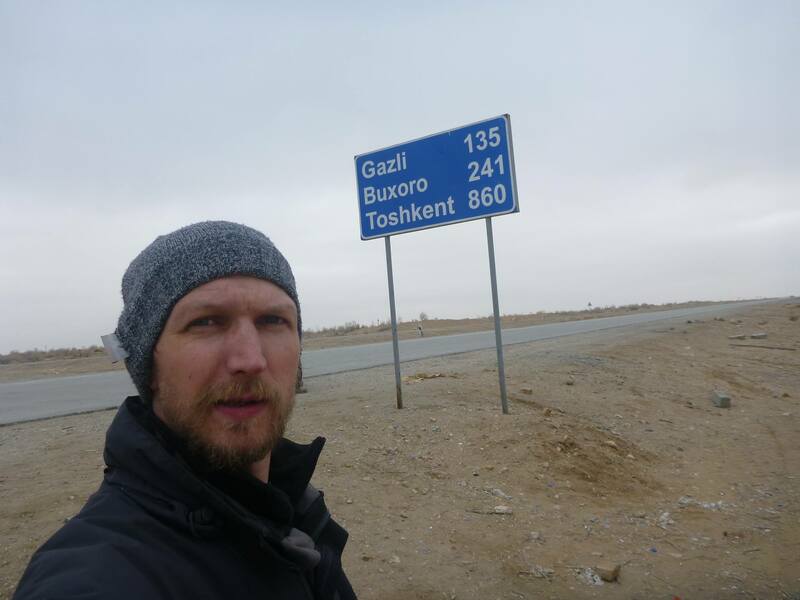 I think he was just trying to describe how a short three hour drive to Nukus turned into a crazy full day adventure all so he could visit a place most people would never heard of because it is that remote. Most people wouldn’t have that kind of patience to do it!